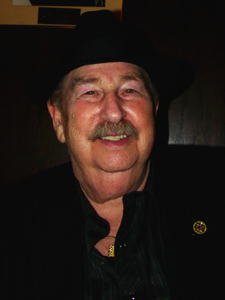 NOTE: Joe Gores died January 10, 2011. This 2009 article speaks of him as if he were still alive. 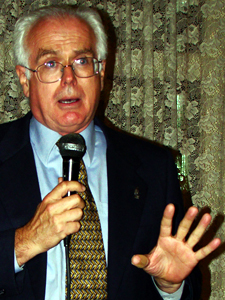 Joe Gores is something of a living legend in the community of mystery writers. Like Hammett himself, he was first a private investigator, then a writer of detective stories. 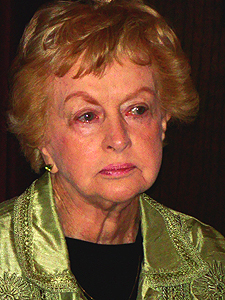 The only writer ever to win three Edgar awards in three different categories (Best novel, best short story, best television episode), Gores is perhaps best known for his DKA novels, featuring the operatives of the Daniel Kearney Agency. He also penned episodes of Magnum PI, and, of course, the novel Hammett in 1978. His latest book is Spade & Archer, the official prequel to The Maltese Falcon. Gores set out to answer several questions: What events made Sam Spade the tough, self-reliant character we see in The Maltese Falcon? Why would he enter into a partnership with Miles Archer, a man he considered an SOB? How did Spade and Iva Archer begin their affair? And why was Lt. Dundee out to get Spade? All of these points and more (Effie is Greek! Who knew?) are addressed in Spade & Archer, and it’s a helluva ride. 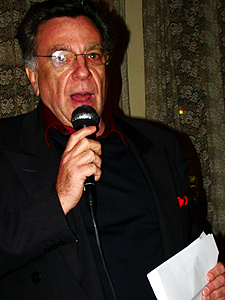 John’s Grill, “Home of the Maltese Falcon,” was the setting for the release party, held on the evening of February 11, 2009, three days before the official publication date. A standing-room-only crowd milled around Hammett’s Den, as the third floor dining room is called. 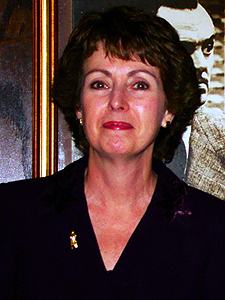 At 6PM, Lee Housekeeper called the festivities to order, and introduced Jo Hammett Marshall (Hammett’s daughter), who spoke about her memories of her famous father. Mrs. Marshall then introduced her daughter Julie Rivett, son Evan Marshall, and granddaughter Tracy Norred, who each spoke in turn. Joe Gores, the man of the hour, was then introduced. The Hammett family presented him with an antique lapel pin: silver, dagger-shaped, and set with a bloodstone. Gores was asked to read a passage from his new book, and he chose to read from the chapter describing how Spade and his secretary Effie Perrine first met. The audience responded with an enthusiastic ovation. 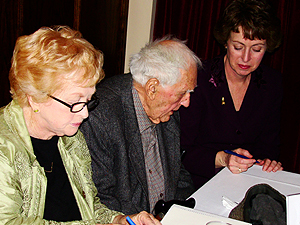 Afterward, the audience was given the opportunity to purchase a hot-off-the-press copy of Spade & Archer, autographed not only by Gores, but by four Hammett family members as well. 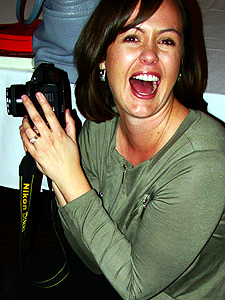 What made you become a private investigator? So I said: “Look, I’ll do a week for nothing. Just let me.” And he gave me an assignment to find this guy. I knew nothing about San Francisco. I was from Minnesota, you know. So I went out and looked for this guy, and I talked to 97 people, hit 147 addresses trying to find this guy. I said: “Yeah, he’s dead. He’s in Colma, in a grave. He’s been there for three years.” (laughs) And he says: “You’re hired!” So that’s how I got into that. How did you become involved in the world of Dashiell Hammett? 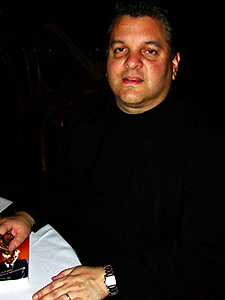 JOE GORES: When I was a kid, six years old, my dad had sort of a study in our home in Rochester, and my mother told me I could read all the books I could reach. On the bottom shelf, which I could reach, she had, you know, Pilgrim’s Progress, and Lives of the Saints, and all of those things. All of the great stuff was up on the higher shelves, but I found a way to crawl up onto a cabinet that was in front of the bookshelves, and I reached down, and two of the books I got were The Mysterious Mister Quinn by Agatha Christie, and The Dain Curse. Both hardcovers. My mother was a mystery fan. I opened The Dain Curse, and here it says: “It was a diamond, all right.” And it just got to me! Then, when I started to read the tough guys, I hit Hammett, and then I remembered The Dain Curse and all of this stuff, and that was it. So when I became a repo man in San Francisco, I was by then a tremendous fan of Hammett and the whole genre. So that’s how I got started with San Francisco and Hammett and so on. 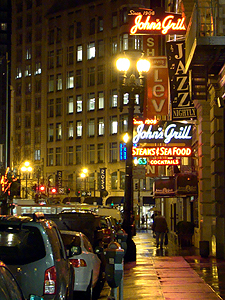 Now in its 101st year, San Francisco's legendary John's Grill on Ellis Street. 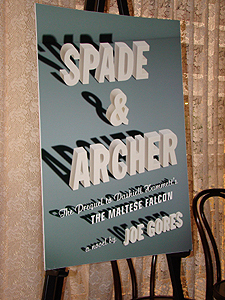 A blow-up of the Spade & Archer dust jacket, designed to resemple a vintage pulp. Publicist Lee Housekeeper was the evening's host. Joe Gores reads a selection from Spade & Archer. A once-in-a-lifetime opportunity: to acquire a first edition of Spade & Archer, autographed by author Gores, as well as four Hammett family members! 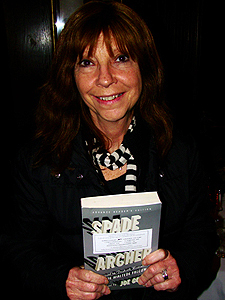 Novelist Cara Black, past president of the Mystery Writers of America (Northern California Chapter), was one of the first to get an autographed copy. 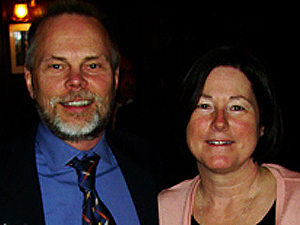 In all its history, John's Grill has never been owned by anyone named "John," until the current owner, John Konstin. 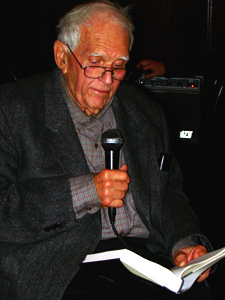 Jack Immendorf, San Francisco's preeminent private eye was in attendance. Publisher and Hammett-phile Vince Emery poses with Hammett grand-neice Laurie Muenchow, the official custom jeweler of the Hammett cult.